NETWORK Lobby for Catholic Social Justice was founded by Catholic Sisters over 40 years ago and has 100,000 activists around the country. We writes today in strong opposition to the newly released partisan Tax and Oversight Package scheduled to be taken up on the House floor as early as today. The bill, unfortunately, mirrors many of problems found in the Tax Cuts and Jobs Law: it was created in secret, it is loaded with benefits for corporations and wealthy individuals, and it adds over $55 billion in debt. We urge you to oppose this bill. 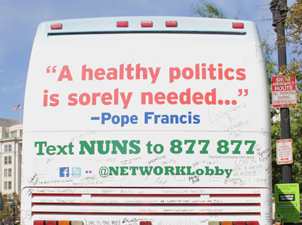 This fall, NETWORK’s “Nuns on the Bus” campaign toured 21 states over the course of 27 days to educate voters about the problems with the TCJA. In state after state, we heard stories from people who are struggling and concerned about the viability of Medicare, Social Security and other vital programs. Working people know the tax law rewarded the wealthy and the well-connected who are already not paying their fair share. We should not be exacerbating that mistake. Rather than giving more benefits to the extremely wealthy, Congress should be repealing its 2017 tax breaks for the wealthy and corporations in order to protect Social Security, Medicare and Medicaid, and to generate enough revenue to make new investments in helping working families like expanding working family tax credits, creating affordable housing and green-energy jobs and providing healthcare for all. Now is the time to stop business as usual in Washington. Americans don’t want to see an end-of-year Christmas tree of gifts for all sorts of wealthy special interests. It is time for Congress to put the interest of the common good over those of the wealthy few. We urge you to vote no on the Tax and Oversight bill. This entry was posted in Front Page, Policy Update, Taxes on November 29, 2018 by laura.